We are saddened to report to you on the loss of a member of college band family. Details are starting to emerge about the loss of Alexander Jones, the 2016-2017 Aggie Band Command Sergeant Major and the incoming Combined Band Commander, who was killed in a head on collision with an 18-wheeler Sunday evening. "It is with extreme sadness that I confirm the death of Cadet Alexander Jones ’18, a member of the Corps of Cadets," said Brig. Gen. Joe Ramirez. "All who knew Alex remember him as a sociable, confident young man who had a resilient work ethic and a good sense of humor. He was a very well-liked young man, and his loss will affect all of us for a long time to come." Jones, 20, was a junior Political Science major. He was from San Antonio, TX and served as the Combined Band Sergeant Major in the Texas Aggie Band. He was also the incoming Combined Band Commander. He was a Ross Volunteer and was looking forward to a commission in the United States Air Force. This a terrible loss for the Aggie Band family. "I want to offer my condolences to Alex Jones’ family, friends and fellow cadets on his loss. We all stand together as Aggies today as we mourn the loss of one of our own. Alex Jones will be missed by all of us," said Brig. Gen. Ramirez. 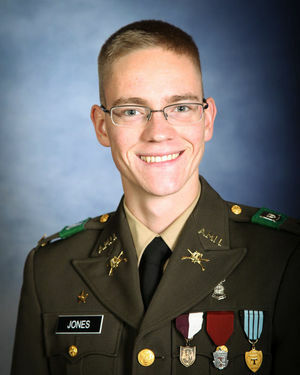 "As an Aggie, I hope the Jones family will take solace in knowing that Alex will never be forgotten, and that the unique Aggie spirit of camaraderie that is such an integral part of Texas A&M and the Corps of Cadets will hold fast to support them in this very difficult time," said Brig. Gen. Ramirez.